Maybe water overflowed from a faucet; perhaps you were the victim of a flood. Bathtub and toilet overflow, broken pipes and several other water-related issues can wreak havoc in your home. 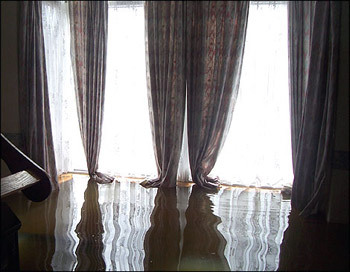 Water damage can destroy your carpet, your furnishings and your treasured heirloom rugs, and the last thing you want to think about is the in-depth cleanup you’re going to have on your hands. With 30 years of flood restoration experience, KIWI Services can come to your rescue. We’ll extract the water from your home, dry your furnishings, carpet and walls, and sanitize the entire area. We’ll deodorize, treat for mold and mildew and handle all of the other aspects of flood cleanup while working with your insurance company so you don’t have to worry.